Singapore’s leading skin expert, Dr Joyce Lim, shares with the Kore Team on expert tips to achieve clear, good and radiant skin which can be difficult to achieve when you are living in a hot, humid and sunny environment the whole year round. Dr Lim provides much needed advice on how to treat acne prone skin and the common problem of pigmentation which affects most Asian women. Wrinkles are part and parcel of the aging process. Most women in their 30s will start to use anti-aging serums or creams in hope of slowing down the aging process. Although anti-aging skincare can in a small way help to repair and firm up our skin, it is not effective when it comes to dealing with wrinkles. Dr Lim talks about the latest and most common aesthetic methods to effectively erase years off our faces. When our skin ages, it becomes loose and we tend to lose the V-shape contour of our face. Many women opt to go under the knife to achieve a V-shape contour. However, there are other aesthetic techniques which do not require plastic surgery. Dr Lim discusses the various methods to achieve the V-shape contour without undergoing plastic surgery. Read about Dr Lim’s expert opinions in a candid interview below. How do we treat acne-prone skin? Acne-prone skin is generally oily skin prone to oil clots. In order to reduce acne formation, it is important to clean the skin regularly and avoid using too much sunscreen and heavy moisturiser. For women, it is best to avoid cleansing oil and cleansing milk, instead using water-based makeup remover. Avoid harsh soaps and scrubs as most acne treatments are drying. If there are small comedones formed, these can be treated with over- the-counter medication which contains salicyclic acid and glycolic acid. This can be in the form of a cleanser or spot gel. If the acne is more advanced and severe with red bumps and with spots which have puss in them, then it is recommended that you see a dermatologist who can prescribe to you topical antibiotics or topical Vitamin A. If you need a more definitive treatment, you can consider taking oral medication such as antibiotics, hormones or oral Vitamin A (isotretinoin). Oral Vitamin A is the only method to control oil production, to alleviate and relief the acne. All other treatments are used to control the acne problem so as to reduce the occurrence of scarring. What are the common types of treatment for pigmentation? Treatment depends on the type and cause of pigmentation. There are generally two groups of pigmentation. They are those which are present at birth or shortly after. These pigments are known as birthmarks. Apart from birthmarks, there are also pigments which appear on one’s skin over time due to exposure to the environmental and weather conditions. For birthmarks, the choice of treatment is usually removal by laser or just to leave them alone as most are not harmful and are basically cosmetic in nature. They will increase in size with age and usually stop growing when adulthood is reached. It is advised that treatment for birthmarks should be start as early as possible. For pigmentation due to exposure to the environmental and weather conditions, there are a variety of treatment options. The most important thing is to prevent the pigmentation from worsening or new pigments from forming. This involves using sunscreen when going outdoors, avoid taking hormonal pills and shun heat exposure. The pigments formed can be removed with creams which contain hydroquinone or with creams which do not contain hydroquinone. The pigments can also be removed with chemical peels, laser or light treatments. What are the common anti-aging techniques used these days to treat wrinkles? There are two groups of wrinkles which are static wrinkles and dynamic wrinkles. Dynamic wrinkles are wrinkles which are seen when one moves his or her facial muscles. For dynamic wrinkles, the only effective treatment is to inject botulinium toxin or commonly known as botox to relax the muscles. This relaxation usually comes on within a few days after the injection and maximum effect is achieved in 14 days. The effects will last from 4 to 6 months. Static wrinkles are wrinkles seen on the skin at rest. There are many ways to improve them. The most common treatment is to apply creams which are known to stimulate collagen growth and hence improve skin firmness and thickness. Among the ingredients which can improve wrinkles include vitamin C, fruits acids, tretinoin and vitamin A, skin peptides and growth factors. Other methods to improve winkles would include using heat to stimulate collagen tissue. The heat can be from radio-frequency, laser lights, broadband lights and ultrasound. For some treatments, you can see improvement in just one treatment, whilst other treatments would require a series of treatments before improvement is visible. Some of these methods are used to smooth out the wrinkles and as for other treatments, they help to stimulate collagen to improve skin firmness and elasticity. How do you obtain a V-shape contour of the face without going under the knife? There are various methods to shape the contour of the face without surgery. A young face is like a triangle turned upside down with the apex of the triangle at the chin level giving it a V shape look. As one grows older, tissue and fat sags and the triangle becomes inverted with the apex on top and the broad base below making the face squarish or broad at the chin level. Fats will accumulate at around the jaw line giving the face a double chin or “heavy” and rotund look. The prescribed treatment would be to lift the lower face and to try to achieve the V-shape or the inverted triangle. This can be achieved with tightening or lifting procedures such thread lifts, radiofrequency treatments such as thermage or ultrasound procedures like ultherapy. If the jaw is square or the base of the face is broad it might be due to a prominent masseter muscle (the muscle we use in chewing). This can be reduced by injecting botulinuim toxin into the muscle and create a more V shape face. Dermal fillers can also be injected into the chin to create a more V shape face. This elongates the lower third of the face and giving the chin a more defined V-lift. Fillers can also be injected at certain points to anchor and “lift up” the tissue. 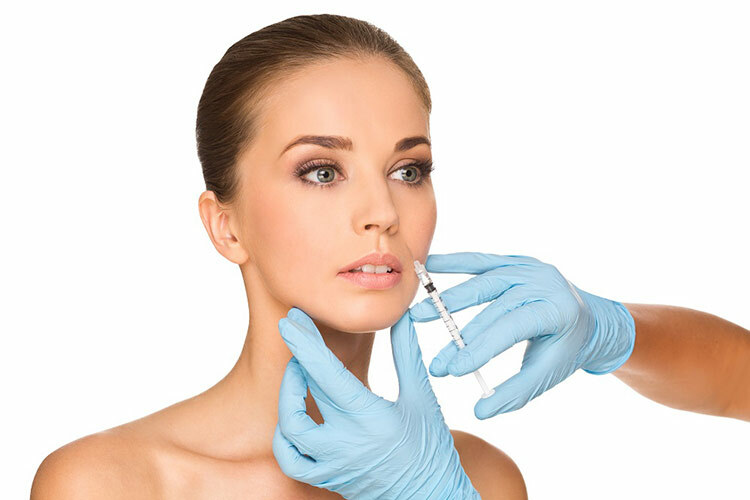 Botulinuin toxin are often added and injected in tiny aliquots along the face to create a mini-lift for the face. Dr Joyce Lim is an accredited skin specialist, recognised and accredited by the Ministry of Health, Singapore and also by the Ministry of Health in Malaysia. She is also a registered doctor with the Health Authority in Hongkong SAR. Dr Lim is one of Singapore’s leading authority in dermatology and aesthetic medicine. She graduated from the Medical Faculty, University of Malaya in 1978 and she completed her internal medicine specialisation and was admitted as a physician member of the Royal College of Physicians and Surgeons of Ireland. Thereafter she served as a consultant physician with the Ministry of Health, Malaysia till 1988. Dr Lim was subsequently conferred the fellowship of the Royal College of Physicians and Surgeons of Ireland in 1992. Dr Joyce Lim completed her dermatological training at the National Skin Centre, Singapore in 1991 and went on to sub specialise in dermatologic surgery and laser surgery. She also did perceptorships under renown dermatologists/dermatologic and laser surgeons in both Europe and the USA. Dr Joyce Lim was the first Division Head, Dermatologic and Laser Surgery at the National Skin Centre, Singapore till 2000 when she left to start her own practice, the Joyce Lim Skin and Laser Clinic at the Paragon in Orchard Road, Singapore. She is currently an adjunct professor with USTI University, Kuala Lumpur, Malaysia. To ask Dr Lim on questions pertaining to aesthetics, beauty and dermatology, kindly email the Kore Team at info@korekulture.com.